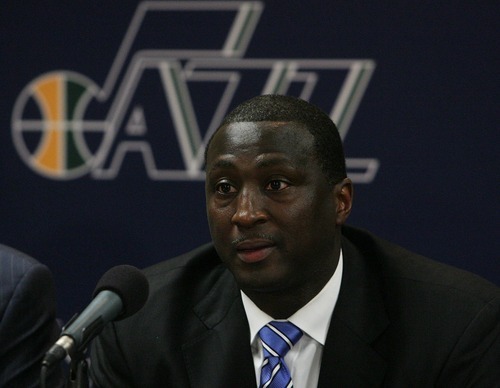 Leah Hogsten | The Salt Lake Tribune Former assistant coach Tyrone Corbin was named head coach of the Utah Jazz on Thursday with the sudden resignation of Jerry Sloan. 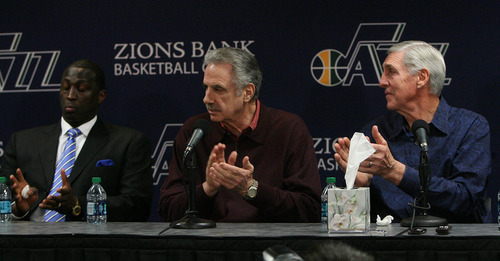 Leah Hogsten | The Salt Lake Tribune Newly named Jazz head coach Tyrone Corbin, left, reacts to the announcement as Phil Johnson and Jerry Sloan lead the applause. Sloan's resignation brings to a stunning end a long career in Utah that included most of his 1,221 career coaching victories and induction into the basketball Hall of Fame. • Spent nearly seven years as an assistant coach for the Jazz, who hired him in 2004 after Corbin had been manager of player development for the New York Knicks under Scott Layden - the former Knicks general manager who's now an assistant to Corbin. • Played for the Jazz and eight other teams during a 16-year career in the NBA - the San Antonio Spurs, Cleveland Cavaliers, Phoenix Suns, Minnesota Timberwolves, Atlanta Hawks, Sacramento Kings, Miami Heat and Toronto Raptors. • Wore No. 23 and No. 33 throughout his playing career. • Joined the Jazz in a trade with the Minnesota Timberwolves for Thurl Bailey early in the 1991-92 season, and helped them twice reach the NBA Western Conference Finals. • Averaged 9.3 points and 4.8 rebounds while playing 1,065 games in his career. • A native of South Carolina, he played for DePaul University  he finished as the seventh-leading scorer in school history, and graduated with a degree in computer science  before becoming a second-round pick of the San Antonio Spurs in the 1985 NBA Draft. • Married to Dante Corbin, with two children, Tyjha and Tyrell Corbin.